This year we have had a lot of interest in people wanting to bring their pets on trips. As one time pet owners, we have tried to be accommodating of such requests and have had some rather interesting trips because of it. We have put the following policy in place to suit all parties. 1/Small Rodents are permitted at their own risk. unless this can be done without slowing down or changing course. 2/Rodents over 10" are not permitted and will be reported to animal control. 3/Primates are not allowed to paddle solo and must be wearing secure underwear whilst on board. 4/Two Chimpanzees are not permitted to paddle tandem kayak together if they are mates. Some exceptions may apply. neither are cats or any other dogs for that matter. These rules seem a bit harsh but they are there for good reason. The NE winds brought some welcome relief to the Georgia Coast this weekend, and along with it the swells from Hurricane Danielle. Tybee kite boarders were out in force in the Triangle. Wind and swells are expected to stay around all week and into Labor Day weekend. We will be running surf demos and intermediate classes all week. Call to schedule a session. 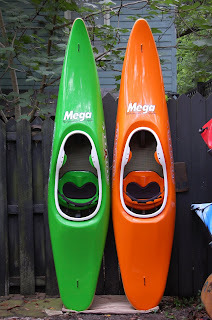 Surf Report from Jim F.
Padddling a Mega Bullitt S.
"Went out Sat am and had some fun. I caught a few very large waves that sent me rocketing across the green face so fast I skipped like a stone. I have never gone so fast in a kayak. I saw you out in long boats and tried to join up but received a beat down in the process. Ending up out of control and too close to the jetty made me run away. Me, Brent and a guy I know from Augusta surfed the early, better waves. It got uglier and crowded later. Too many swimmers and surfers to play safe so I packed it in around 11 am. It would have been a shorter session without the Bullitt. The longer hull coupled with the tactics taught during your last surf class in FL allowed getting out to be allowed. I bumped my way over some seriously large bruising piles of foam that should have endo'ed me and sent me back to the beach dead tired. If I had still been in my old boat I would have gone home after 30 min." I was out earlier today in the Mega BX and had a similar time, although the wind strength had increased. These NE winds have bought a welcome relief. We surfed the north end around the rock jetty. It provided a nice eddie and gave us some great rights. 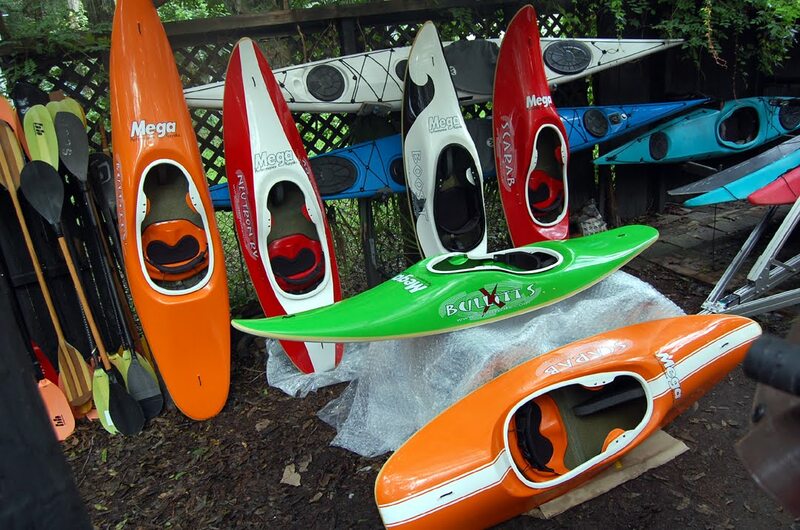 Ooh, how we love the smell of fresh made kayaks in the morning. Yes, another hot batch of scones from the Mega ovens showed up here yesterday. And just in time for Hurricane Danielle as she makes an off shore pass. Surf for the weekend looks super fine but not so clean at 5-6ft with a 15 sec period. On shore winds increasing thru the day.. 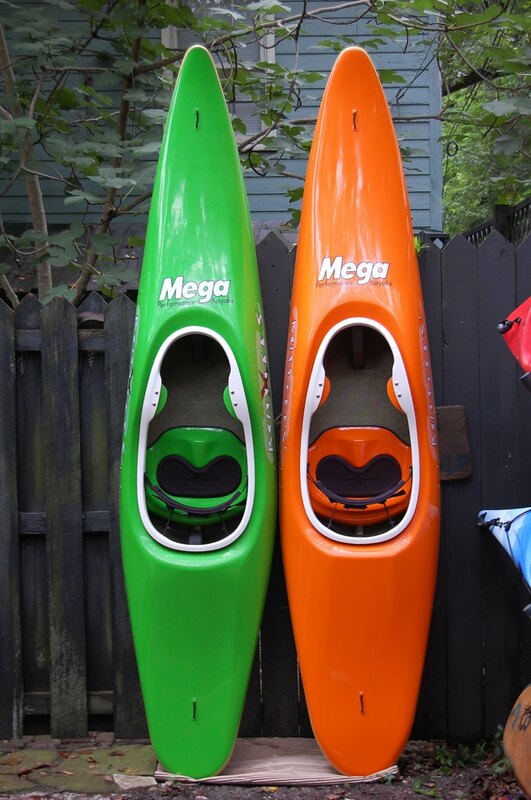 Conditions like that suit any Mega surf kayak, but our current flavour of the month is the Mega Bullitt X. Looking at the two HP Bullitt boats, they appear quite similar, but take another look and you'll see a slight difference. Although slimmer in the nose and tail, the big difference is really in the hull. Softer rails forward of the hips makes for a very forgiving re-entry and bags of rocker makes this boat super quick to change it's mind. The Bullitt X is a ton of fun in all conditions and has a similar handling character to it's big brother, the IC Bullitt. If you are sick of getting a beating just to reach the line up and feeling the steady approach of old man timey, or just want a different style of surfing..this is the perfect boat. Both the X and the S are very suited to east coast crud. Demo these boats any time, but not his weekend, we are 'busy'. "After 8 days straight on the water, I'm feeling tired. Eight days is not a record by far, I must be wearing out. It's been hot and heavy here for 9 plus weeks. Throw in a whole slough of visitors who would otherwise be vacationing in the Gulf, and it all adds up to quite a harvest. No complaints. 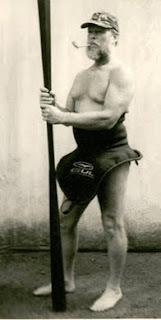 Paddling for a living is a lofty incarnation, a great promotion to be thoroughly apprecitative of . But it is hard work, being a guide that is. Not 'hard' like moving furniture in NYC or fighting a counter insurgency in a feudal society...more like riding the mountain bus, on a mystery tour with the psychiatric ward. Working with People is hard work, albeit infinitely interesting and rewarding. Ultimately, being a guide is all about people. It's too hot here to wear any clothes. It's even too hot to wear a hat. Is a hat really a good thing to wear when it's hot ? Sometimes I kayak naked, but nobody knows because of my skirt. The only time I can wear cloths is when I'm driving fast in the jeep in the pouring rain, returning from the beach. Then I can wear my Fanatic rain coat, but with the hood down. It's still way too hot to wear a hood, even without doors and windows in the rain at 50 mph.."
Since the writing of the above entry, the guide responsible has been fired. Saturday and Sunday Sept 25 and 26. Our meeting was called to order by Shelley Merrick. Minutes from our July 19, 2010 meeting were approved and seconded. Treasurer’s Report – Joe Richardson reports that we have a balance of $1,825.98 in our account. $330.00 has been earmarked for Surf Etiquette signs. Adopt-A-Highway – We will schedule an Adopt-A-Highway cleanup for September 4, 2010 – 7:30AM to9:30AM. An email will be sent out before the cleanup to see if you are able to volunteer. Savannah Harbour Deepening Project- The impact study for the Deepening project is due some time in October. Surfrider will send them a letter stating our chapters position on not favoring the near shore dumping of the residue from the dredging. Beach Signs - Cindy Wisner have received pricing for the manufacture of the Surf Ediquttee signs and is in the process of trying to find the originator of the art work so we can obtain the digital files for reproduction. If we can get the digital files for the job, we can eliminate a design fee when they are manufactured. Tybee has “OK’ed” the design and installation of the signs. Our treasurer has set aside the money needed for the production of the signs. Our chapter will also contact a local design artist and ask if she can create a digital file for our needs. A motion was moved and approved to pay as much as $100.00 for this service. 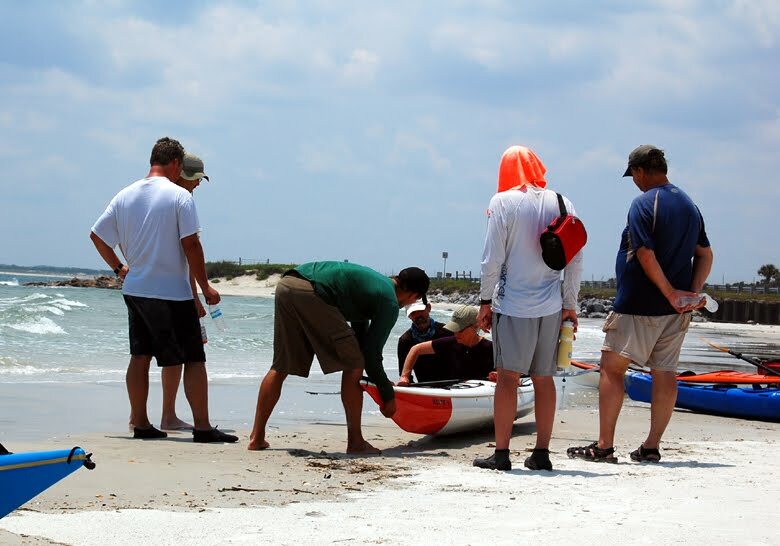 Tybee Bird Study- Joe will call for volunteers soon for early morning low tides collections. He may try to get three new studies in during the month of September. If you would like to be included on Joe’s volunteer list, please let him know at joe@ceasurf.com . Surf Camera Update- The Camera at the Ocean Plaza is up and running again. The link to the site is http://www.oceanplaza.com . On the site, there is a link to a “Live Web Cam” that shows a view directly out from the Ocean Plaza. Joint Chapter Meeting- We discussed a joint chapter gathering with the Atlanta Surfrider Chapter and our friends in St. Simon’s area too. We will have to brainstorm to come up with some good ideas for some sort of joint venture. If you have any suggestions, just let anyone on the Executive Committee know. Beach Party Idea - Mark the date / October 16, 2010. 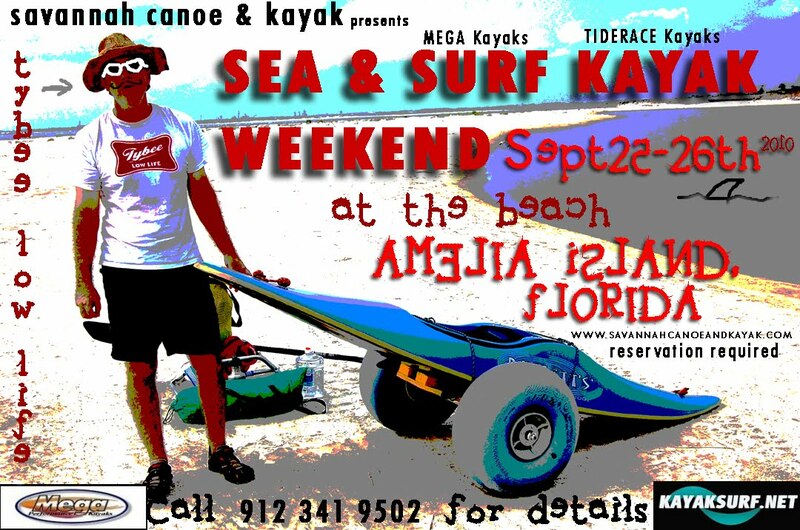 This is the date of one of the Eastern Surfing Association’s Surf Contests at Tybee and we thought it might be a fun idea for our chapter to also use that day for a “word of mouth” gathering on the beach for a little fun and fellowship, and hopefully a few waves. Executive Committee Elections – In September, our chapter will take nominations for elections to the Executive Committee. Nominations will be taken from the floor at the meeting, by mail or nominations can be emailed to me ( wilsonjg@aol.com ) before September 12th. There will be an odd number of members on the Executive Committee – in our case that will be 7 members. Each member of the Executive Committee serves a two year term in the position that they are placed, but not successive terms in the same position. At our October 18, 2010 meeting, a secret ballot vote will be taken and counted to determine the 7 members that have been elected to the Executive Committee. Those 7 members will then determine amongst themselves who is placed in which position. The Surf Jam is back ! 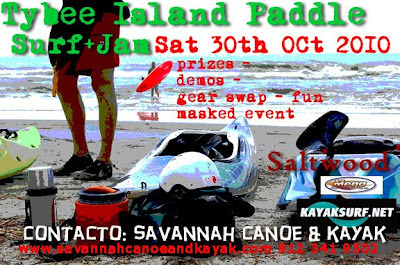 Fewer categories and cheaper entry fee are the only changes to this years community inspired sit down and surf event. Due to the timing of the Jam, we were thinking of making the wearing of masks compulsory, but decide it will be optional. Prizes will be given for best masked ripper. Money raised from this event will be deposited in our bank account. Just as they were starting to feel the shackles of authority fall away, those poor kids have to go back to school already. Yes, the light burns bright at the end of the tunnel and the heat seems a little more bearable as all the little paddlers trot off to Wally World for a tax free pencil case. And along with the distant sound of the school bell comes the closing of the summer season. Farewell small Beings, you kayaked so well. And here at SC&K, it's sale time ! Some other styles and models available also. Check the link on the left. FREE Fireworks and Jazz at Old Fort Jackson! The annual Old Fort Jackson Auction and Low Country Boil is Saturday, August 28th at 6pm. Bring the whole family to Georgia’s oldest brick fort on the beautiful Savannah River for a silent auction, fun activities for the kids, musical entertainment provided by The Savannah Stompers Jazz Band. Savory low country boil and mouth-watering barbeque will be available for purchase. The evening will conclude with cannon firings and fireworks! Special thanks to the Savannah Pilots Association for sponsoring this event. Old Fort Jackson is operated by the Coastal Heritage Society, a non profit organization that preserves two National Historic Landmarks. The mission of the Coastal Heritage Society is to preserve the cultural heritage of coastal Georgia and adjacent regions and to provide relevant educational experiences for the public. Thanks again to everyone who has contacted Rep Jack Kingston and other local officials about the Harris Neck issue. Representatives from the Friends group met with Rep. Kingston on August 6th to voice our concerns. It appears that he will attempt to get a congressional hearing on the Harris Neck issue, but is unsure if he will be successful. We argued to no avail that the issue has been adjudicated multiple times and that further investigation is not needed. It is clear that the more he hears from constituents and others about their support for preserving the refuge, the less enthusiasm he will have for pursuing the hearing. If you have not done so yet, please send a letter, an e-mail, or call/visit his office as soon as possible to let him know you support keeping Harris Neck the vital refuge that it is. Addresses and other resources are available on the SNWR web site at http://www.coastalrefuges.org/Harris%20Neck%20resource%20page.htm. 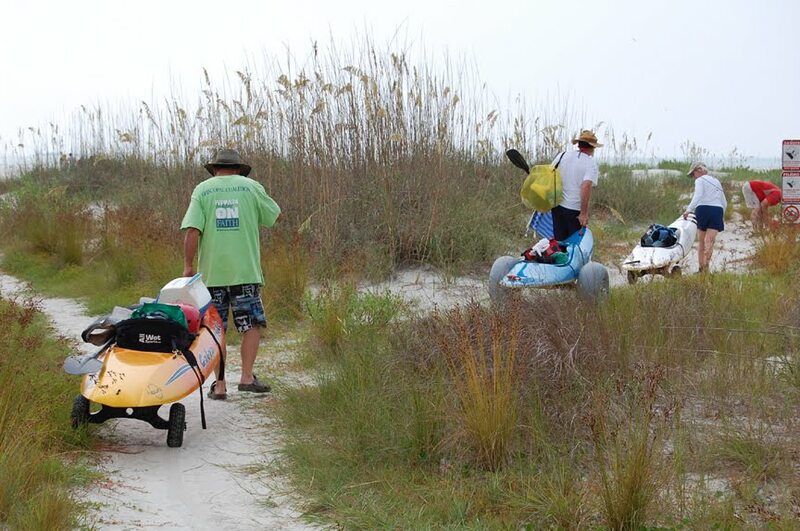 Your Friends group has established a weekly maintenance day at the Savannah NWR. We invite anyone who wants to put in some volunteer time to show up at the Visitor Center between 9:00 AM and 3:00 PM every Thursday (except Federal holidays). Activities will be tailored to your abilities and interests and will include both indoor and outdoor projects. Weekly chores will include mowing, edging, weeding, watering, sweeping, filling bird feeders and bird baths, and cleaning exhibits. Other activities will be also be available as the needs arise and time permits. The first meeting of The Beech Hill Volunteers will be this Thursday , August 12, 2010. (The VC is located on Beech Hill Lane). Bring your gloves, sun screen, and enthusiasm. Tools and water will be supplied, show up early to beat the heat. No RSVP needed. Tybee Island, between 11.30pm and 3.00pm last night some 80 lil' loggers clawed their way to the surface and headed off down the beach. Unfortunately, many of the hapless half shells headed along the beach towards the bright lights on the Tybee pier. 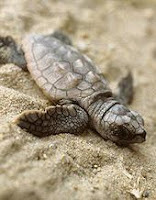 With only a limited amount of energy to reach the ocean the baby reptiles first steps are crucial. This nest, located at 12th St, was under surveillance due to it's close proximity to the pier. volunteers were positioned at the surf with bright lights to attract the turtles that way. It was a successful assault for the reptilian critters with all 80 finally reaching the ocean. It's been a record season for turtle nests on the Ga coast this year, with over 1600 so far and still a couple of weeks to go. Sea & Surf Kayak Amelia Weekend Report. If you think it's hot in Georgia, take a trip down to Florida ! We were definitely sympathetic to toasted cheese melt on Friday, but thankfully the thunderstorms rolled through in the night and Saturday cooled off some....a little.. ish. At 75', at least the water was cooler. We had a great bunch of Surfistas from across Florida for both days, starting in Surf Kayaks for day 1 then transferring to Sea Kayaks for day 2. A beautiful location just north of Jacksonville gave us everything we needed. Skill level was across the board, from first timers to experienced stand up surfers. paddle surfing. 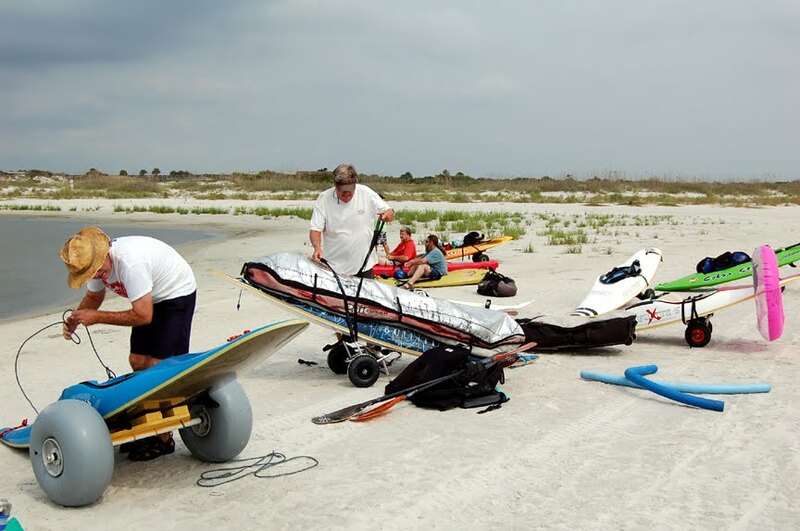 We also looked at the advantages and disadvantages of different boat design, personal physiology, mental preparedness and knowledge of the surf zone. After lunch, surf was small, but very rideable. The nice thing about small conditions is that it focuses the student much more on the subtleties of the boat/body/wave dynamics..this is especially good for students of a higher caliber. We experimented with take off, perfect trim and edging. Thanks to all the students for your enthusiasm and friendships and making it a whole lot of fun..as it should be. 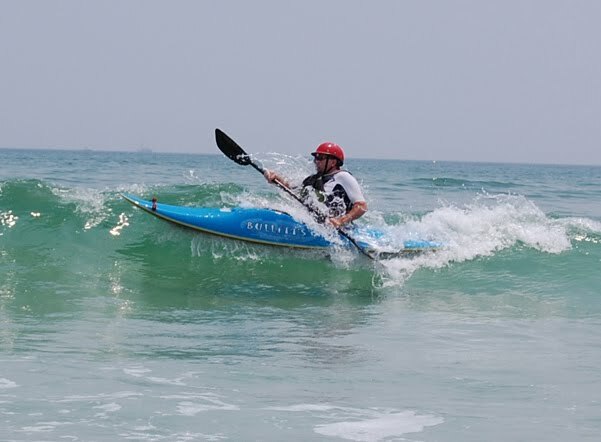 Day 2 was Sea Kayaks in surf and how to better control them in waves and on a beach approach. We will be returning to this location in about six weeks time, as well as going on further down the coast for a session with other friends and fellow surfers at NSB.